They started off as monumentally huge clouds of gas, which then collapsed. A lot of things happened at that point, including star birth, interactions with other galaxies, the formation of a giant black hole in the center, perhaps the triggering of events that lead to the creation of fantastic spiral arms, and more. Eventually, you get galaxies as we see them today: Some big, some small, some spiral, some elliptical, some with no real shape at all. But some are still fond of the olden days, and haven’t changed much since then. These few small galaxies are either much as they were ten billion years ago, or perhaps they formed more recently and are just now going through some of those early stages all the other galaxies did long ago. One such galaxy is Kiso 5639, a dwarf irregular galaxy roughly 80 – 90 million light years from our own. It’s probably a flat pancakes shape, but we see it edge-on, so it looks elongated. One end — the “head” — is much brighter than the other, making it look like a tadpole or comet. It’s small, only about 10,000 light years long. Our Milky Way is fully ten times wider! So Kiso 5639 really is diminutive. Tadpole galaxies like it are pretty rare in the Universe today, making up less than one percent of all galaxies. But in the early Universe they were much more common, more like 10 percent of all galaxies. We can actually see these galaxies; they’re so far away their light took over ten billion years to reach us, so we see them as they were when the cosmos was young. Why do we see so few now? Probably because this tadpole shape is only a stage galaxies go through as they age, and it doesn’t last long before collisions and acts of cannibalism cause galaxies to grow. Well, most galaxies. We do see ones like Kiso 5639 today. These are likely the remnants left over that never got close enough to other galaxies to be affected by them, so their evolution was stunted. Kiso 5639 is asymmetric, as you can see. The head (which is roughly 2,500 light years across) has quite a bit of gas, and stars are actively forming there. The astronomers who took this image examined the detailed colors of the stars using Hubble Space Telescope and found the stars in the head are under a million years old, while in the rest of the galaxy stars range from millions to over a billion years old. Not only that, but the head has a higher ratio of hydrogen and helium than the gas in the rest of the galaxy (or, if you want to think of it the other way, the tail of the galaxy has a higher abundance of heavier elements than the head)*. Heavy elements are created in stars as they are born and age, and they scatter them back into their host galaxy when they die. Gas in older galaxies therefore tends to have a high abundance of these heavier elements like oxygen and iron. But gas between galaxies has no stars, and therefore has gone unenriched for eons. 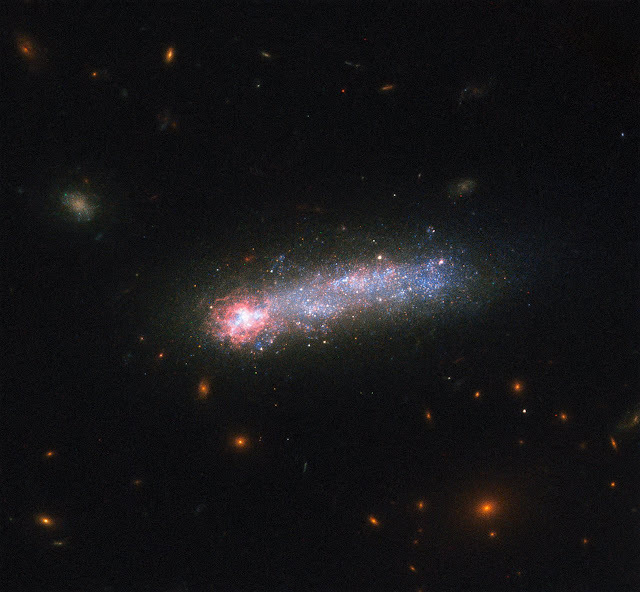 It’s still mostly hydrogen and helium, and it’s thought that tadpole galaxies move through space head first, collecting this primitive intergalactic gas and getting it piled up there. This is triggering the star formation in the head, and also explains why the elemental abundance is so different there than in the tail. Galaxies like this are wonderful to study; they’re like a relic of the past, a glimpse into an adolescent stage of growing up that we otherwise wouldn’t be able to study in detail. Seeing Kiso 5639 just 80 million light years away, and not 12 billion, makes it a ripe target for study. And if our own galaxy went through such a stage — which it very likely did — then it’s like a time machine into our own past.